The Sheep Whisperer: The Dolphins Not From Miami,Take 2! In the book, Random Acts of Kindness by Animals, there's an awesome story about Dolphins, & the bond they have between mothers & babies. When a baby is caught in a tuna net, a mother will desperately seek to join it, knowing that it means certain death. The mother will sing to the baby & cuddle it, as they both drown in the net! It has been reported by the tuna industry, that the highest percentage of Dolphin deaths, in net entanglements, are mothers & calves! Wow! Now that's love! "Ewe & me & me & Ewe ...So Happy together!" snaps of the jaws, flapping of the tail, & butting of heads! They even become "Rescue Rangers" when a dolphin is in a crisis! "Pod-ding" along, singing a song, side by side! I'm a little "Up in the Air" about my plans tonight! How about Ewe? 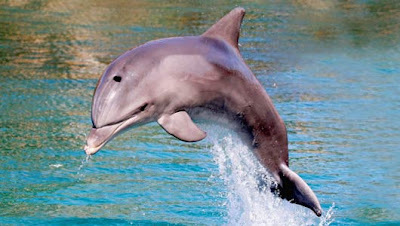 Bottlenose Dolphins may look like fish, but they are actually mammals! They have to breathe air just like we do. Do Ewe know why they are called Bottlenose? It's because their 3-in. long beaks are shaped like bottles. Did Ewe know that the "killer whale", or Orca, is actually considered a Dolphin? I love my Bottlenose! It helps me find hidden food on the bottom. Family life is important to the Bottlenose. 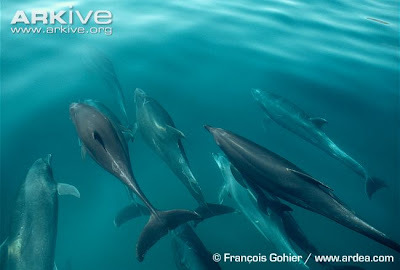 Males are larger than females & each pod family has a female in chief. Females give birth to 1 calf after a pregnancy of 12 months. The calf is born tail first to avoid drowning, & nurses underwater for about 8 months. Calves are 3-4 ft. long & weigh about 40 lbs. 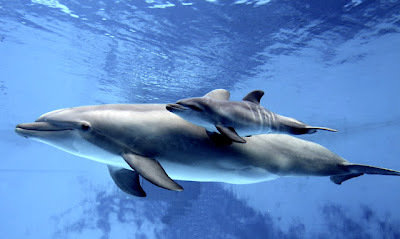 Pod Dolphins are so close, they even nurse each other's calves, which stay for 2-3 yrs.! I'm sticking closer to Ewe than peanut butter does to bread! 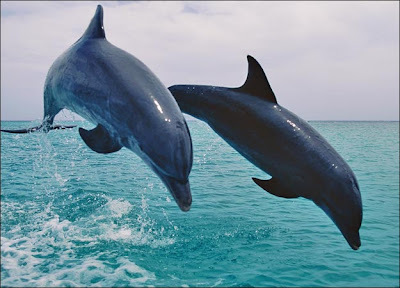 Dolphins have some unusual peculiarities! First, unlike fish which move their tail side to side, they move their tail up & down. Next. 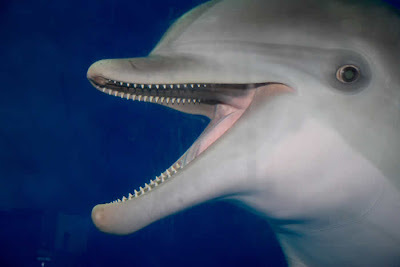 adult Dolphins have up to 210 teeth that are used to hold the food which they swallow whole. 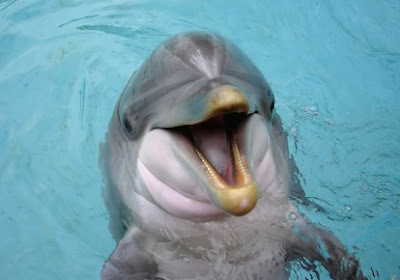 Third, Dolphins were created to stay awake to breathe every few minutes , while one side of their brain sleeps. At this rate, they sleep about 8 hours a day. Finally, They do not have a sense of smell, yet have excellent vision & hearing. I'm not only humble, but quite fascinating! Don't Ewe agree? Once Ewe get to know me, Ewe will just flip over me! Sheep & Dolphin mothers both bond with their young. 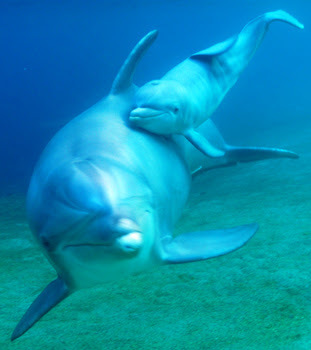 Dolphin mothers will sacrificially die for their calves. Sheep have a different story. They have a Shepherd who's willing to die for them. Sheep have a "Big" reason to be Grateful & Celebrate! Today is the first day of the rest of Ewer life. 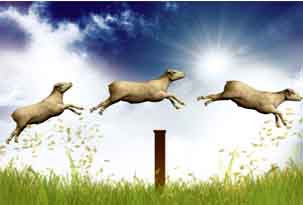 Think about the love of the Good Shepherd as Ewe face the challenges of the day.